When I started this project, I never realised how many components made up this Pathé Marignon projector. above As an example, look at the lens holder in this photo. A very intricate assembly built around a precision aluminium casting. The lens itself is threaded and can be push into and out of the holder against a sprung pin which mates into the thread on the lens. The pressure plate is visible in the foreground and in use is held against the gate by pressure from two small springs, just visible in this photo. Some of these screws and components are very small and require a jewellers screwdriver to move. Unfortunately the paintwork on this piece, although in better condition than that on the main chassis, had also been affected by 50 years of oil and grime. It will need repainting, and to do that means completely disassembling it back to the plain aluminium casting, then removing the old paint and re-spraying it with new paint. A collection of small used yoghurt containers proved invaluable for this project. As each subassembly is taken apart, all the pieces are placed into one or more carefully labelled yoghurt containers. above Here is a view underneath the projector base, after it has been removed from the metal box which my father had fitted and which housed the controls and electronics for sound-on-film. You can see the large brass flywheel poking through a hold cut into the metal base. 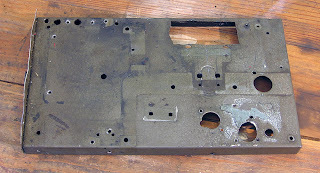 The flat brass plate is about 6mm thick and is used as reinforcement for the comparatively thin steel chassis. Onto this brass plate the flywheel bearings were mounted. None of this will be needed in the refurbished machine, because my plan is to remove the sound capability and restore the projector to its original silent condition. above Here is the flywheel and its shaft and bearings viewed from above. This entire assembly was added by my father in the 1950s. It’s certainly very solid. 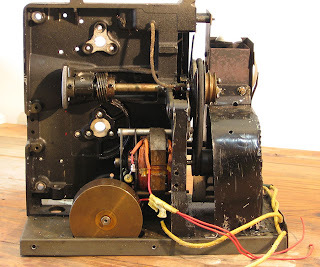 Together with the metal box mounted underneath the machine and containing a heavy transformer for the exciter lamp, these additions would have added considerably to the weight of the projector. This entire assembly will be done away with. 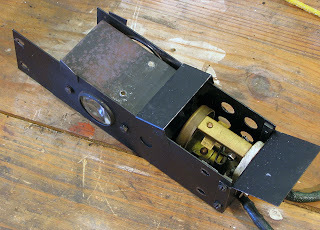 The flywheel is not needed for a silent projector and the metal base has been drilled and filed so many times that it would be impossible to repair. It will be replaced by a new base. You can see a rounded-triangular cam on the end of the drive shaft. This moves the claw mechanism up and down while at the same time, a ramped ring on the shutter assembly (you can’t see the ramping easily in this photo) pushes the claw forwards when it needs to grip the film. It’s a simple yet ingenious mechanism which works quite reliably. above Taking things one step further, here is the old metal base with the flywheel assembly removed. This is one for the dump. above A few steps later, we can see the inside of the aluminium chassis with all but the motor and claw mechanism removed. I am impressed with the quality of engineering and the finish in this machine designed and made in the early 1950s. The chassis however, like almost every part of this machine, is covered in a thin layer of oil. The outside grey crackle-finish paint has changed colour from its original neutral grey (visible in parts newly exposed) to a dirty green-grey. It needs to be completely stripped and repainted. above A view from the rear gives a clearer look at the claw mechanism visible above the motor. You can see the layers of grease, oil and dust on the unpainted metal surfaces. 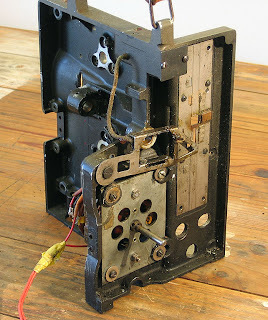 above A closeup of the motor and claw mechanism with the rear of the film gate visible at right. The motor is a subassembly which mounts onto the main cast aluminium chassis with four screws and a set of eight rubber washers to isolate the motor vibration from the main chassis. Unfortunately, as can be seen here, these rubber washers have long ago perished, not helped I’m sure by the presence of oil. They will need to be replaced also. above The lamphouse subassembly is made from folded sheet steel, painted black. At the left you can see the condenser lens which focusses the light onto the film gate. The lamp is 110 volt 250 watts. I’m not sure whether such lamps are still manufactured, but luckily the lamp in the machine still works and my father had the foresight to purchase a stock of spares which may come in useful. Note the brass and porcelain lampholder visible through an opening to which the fan cowl connects, ensuring an updraft of cooling air to prevent the lamp from overheating. This project began with the desire to show some old 9.5mm films. The narrow film gauge had been used by my father to record family activities during the 1950s and his collection of a few dozen reels of 9.5mm, both colour and black and white came into my keeping a couple of years ago. 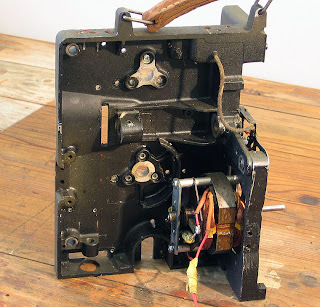 Although the Pathé Marignon projector worked when plugged into its 110 volt transformer, it clearly was in a bad state of disrepair. Superficial cleaning would not be sufficient. There were signs of oil in every nook and cranny. The paintwork had turned from grey to a dirty olive colour. And the myriad modifications over the years had left the chassis pock marked with holes, some of which were covered with makeshift patches of cardboard, plastic or tinplate. In any case it would be a challenge to take apart the machine, clean every piece thoroughly, patch the chassis, repaint it, and reassemble. above Here we see the upper cast Aluminium chassis removed from the lower chassis which was added by my father and was not part of the original machine. The cast chassis bolts onto a small folded steel base. 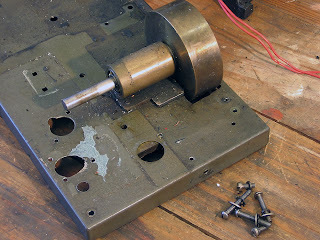 In this photo you can see how part of that base had been cut away to accommodate the flywheel for the sound drum. 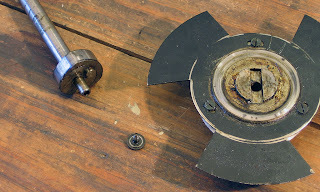 The gears which drive the feed and take-up sprockets have been removed. 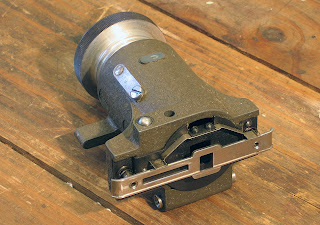 Each gear fits onto a spindle which feeds through a cast Aluminium “housing” mounted on the film side of the chassis. 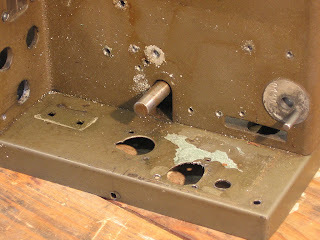 These “housings” have been removed also and you can see the three holes for the mounting screws, top and bottom. After removal, I placed each part into a small plastic used yoghurt container and carefully labelled the container with the function of the part. In some cases I also made notes and sketches in a notebook in order to guide the reassembly process later. The order of washers or pieces which fitted onto a shaft is an example of information which would be easily forgotten and the absence of which could make reassembly difficult. 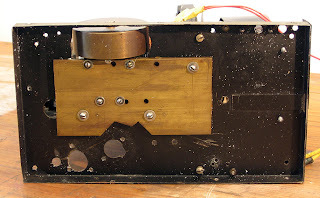 above In this photo of the film side of the chassis, the lens assembly, sprocket housings, feed rollers and reel arms have been removed. It gives you a better look at the dirty and adulterated condition of the chassis. 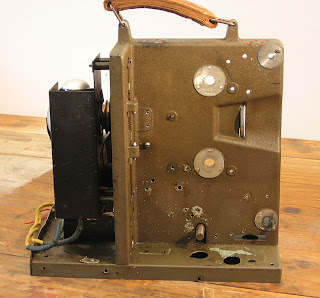 A lot of holes which are no longer needed — in particular those associated with the optical and magnetic sound systems which the projector had sported at various times. The folded steel base was no longer straight. Repairing this would be impossible. Simpler to just replace it with a new steel base made for the purpose. above Now a closer look at the area of the chassis which had accommodated the sound machinery. The three holes at the left are part of the original Pathé manufacture. 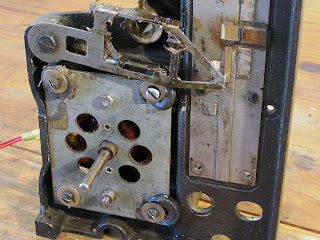 They accommodated switches for motor, lamp and speed control. However they had been disconnected when these functions were moved into the secondary chassis in the 1950s. The old holes had simply been covered by a piece of tinplate painted grey. The condenser lens assembly for optical sound had protruded through the left hand hole in the folded steel base. The right hand hole had accommodated a socket for a photo-electric cell added in the 1950s and subsequently replaced in the 1980s by a phototransistor pickup.